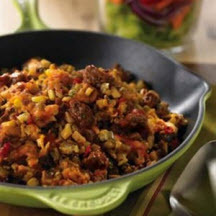 Look no further for a quick and easy recipe to fix a family-pleasing skillet meal on the fly. Spray large nonstick skillet with cooking spray; heat over medium heat until hot. Add potatoes; cook 10 to 12 minutes or until lightly browned, stirring occasionally. Remove from skillet. Keep warm. Brown Ground Beef in same skillet over medium heat 8 to 10 minutes, breaking up into 3/4-inch crumbles and stirring occasionally. Remove drippings. Season beef with salt and pepper, as desired. Stir in salsa, corn and 1/4 cup cilantro; cook 5 minutes or until heated through, stirring occasionally. Stir in potatoes; sprinkle with cheese. Cook 1 to 2 minutes or until heated through and cheese is melted. Nutritional Information Per Serving (1/4 of recipe): 392 calories; 9 g fat (4 g saturated fat; 3 g monounsaturated fat); 82 mg cholesterol; 1109 mg sodium; 44 g carbohydrate; 3.8 g fiber; 35 g protein; 8.4 mg niacin; 0.7 mg vitamin B6; 2.4 mcg vitamin B12; 4.6 mg iron; 24.1 mcg selenium; 7.2 mg zinc.